Alex Ovechkin says he's ready to play Tuesday against Carolina. Whether he will remains in the hands of Capitals coach Bruce Boudreau, who as of Monday afternoon had no answers. "I'm ready to go," Ovechkin told reporters at Kettler Capitals Iceplex in Arlington, Va. "But how it's going to work (Tuesday), I don't know." Ovechkin has sat out the last three games with what the team called "nagging injuries," but he was on the ice for Monday's practice and taking part in full-contact drills. The Capitals play Tuesday against the Hurricanes and again Thursday against Columbus. Boudreau told reporters he had to talk to head athletic trainer Greg Smith before discussing Ovechkin's status. Ovechkin had 21 points in the 16 games prior to leaving the lineup. He's sixth in the NHL with 77 points in 73 games. "I was just skating (to) see if it (his injury) bothers me," Ovechkin said. "It's not bothering me and I think I'm ready to go." 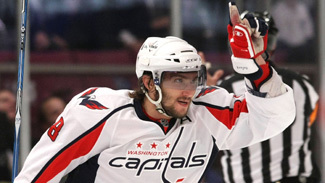 The Capitals are 2-1-0 without Ovechkin. "It's not just a one-man team," Boudreau said, "even though he makes our team better when he plays." Washington center Jason Arnott also was participating in full-contact drills Monday and believes he should be ready to return later in the week. After the Carolina and Columbus games, Washington hosts Buffalo on Saturday. However, Thursday's game against the Blue Jackets appears to be Arnott's target. Arnott has missed the last six games with an unspecified injury. "We had some good skates while the team was gone and we'll just have to see how it goes," Arnott said. There also was some promising news on the Mike Green injury front. The Capitals defenseman, out since Feb. 25, skated in full pads for roughly 25 minutes prior to the full team workout Monday. Green's injury has not been specified due to team regulations, but the Washington Post has been calling it a concussion. Green, who has missed 20 of the last 22 games, told reporters he hopes to participate in a full team practice this week. There is no firm timeline for his return as he still has to pass a series of tests per the NHL's return-to-play concussion protocol. "There is a protocol you have to follow so hopefully this week I'll be able to get out and do a full practice, get that under my belt so I can move forward, take some tests and get back in the game," Green said. "But there is no way to tell. We'll see how it goes this week." Boudreau said last week that Green would need at least three full-contact practices before he is allowed to play. "I think three would be good," Green said. "It's going to take some time to get back in shape. I haven't skated for a long time. I'll skate by myself here and then hopefully get some practices with the team and get comfortable again. I don't want to rush into a game. I haven't played in a while and I want to get in the best shape possible going into the playoffs." Washington goalie Michal Neuvirth also practiced Monday. He fell ill over the weekend, so the Capitals had to recall Braden Holtby from Hershey of the American Hockey League to start Saturday in Montreal. Holtby had an 18-save shutout but then was returned to the AHL following the game.